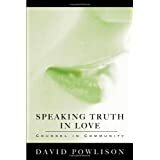 Speaking Truth In Love ReviewSpeaking Truth In Love is the lastest book by David Powlison, a faculty member at Westminister Theological Seminary and The Christian Counseling & Educational Foundation. In his own words, it is, "a book on how we are to live together." Although primarily directed at pastors and counselors, there is much here to be savored by every child of God. Indeed, an emphasis of the book is that speaking truth in love, wisdom, and grace into another person's life is both the privilege and responsibility for every Christian, not just the "professionals" or the "trained." There are seventeen chapters, which are really separate essays all looking at differing facets of counseling, or "loving another person well" as Powlison puts it. Chapter 1 is an extended reflection of Psalm 119, beautifully portraying it as the cry of a faithful heart toward God. It is worth the price of the book for anyone struggling through a trial or helping another. Chapter 2 talks about the need to face the truth of our rebellious flesh, while chapter 3 talks of hearing the music of the gospel. Chapter 4-8 deal with various practical steps of preparation, listening, and questioning, while chapter 9 specifically deals with gently handling people who have already been immersed in the false psychologies of the world. Chapter 10 starts looking at a more global emphasis, challenging pastors (and all) to consider that most of the "ministry of the Word" that Christ actually did was what we would now term private and small-group counseling, and not preaching sermons. Chapter 11 looks at how counseling should fit into the ministry of the church, and chapter 12 looks specifically at how the nature of prayer fits into counseling in the church. The last chapters look at pastoral counseling, women in counseling, when to refer, where to train, and lastly a guiding doctrinal statement for Biblical counseling. This is a rewarding book written by a wise servant of God, giving insight and direction on both the nature and the challenges the church faces in fulfilling our mandate on speaking truth in love to each other. Want to learn more information about Speaking Truth In Love?